Been awhile since I blogged but have still managed to keep collecting while life decided to throw a curve ball. In short, the publishing company I had worked at for 16 years at sold and the new company decided they didn't need our wonderful and extremely talented design team. Took me a couple of months but landed a great contracting gig (that hopefully turns into the FT position I interviewed for and am a finalist) for a leading, national financial services company. I won't show any pics from my Heritage hobby box other than I received 8 SPs and two of them were Jeter. The regular SP and the "action shot" SP. No minis, no relics, and the real one auto is a redemption for McGriff/Freeman. Haven't rubbed the code or redeemed it yet in case any Braves fans want to trade for it. Was at a card show in CT two weeks ago and was able to grabbed another 17 SPs for what ended up being about a buck fifty each. Passed on a mini Jon Lester for $20 as it was the first mini I had seen. Didn't realize there were minis in the product. In any case, I have/will be posting a needs list. Still need some base cards and down to 50 SPs needed. Also, I am still working at the original 1965 Topps set and just recently landed these from eBay. Mantle is the last big card I needed (besides the Koufax and a couple other HOFers). Mantle, Tresh, and Howard all came from the same seller and all under the price of a Heritage box. It was nice that these cards help cut into the 4/5th series that I am missing a ton from. 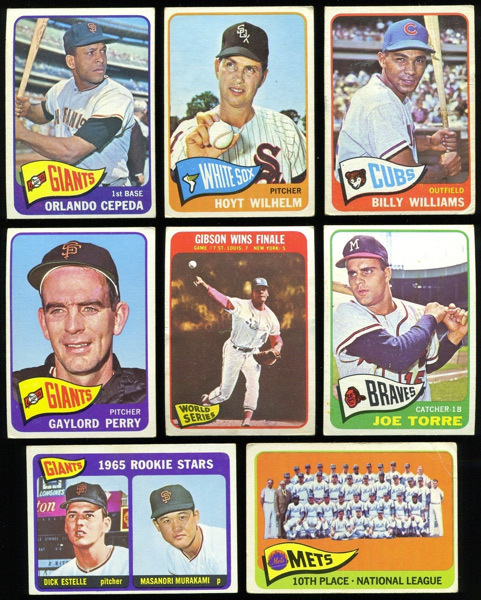 I hope to post a little more often, I still need to scan and show off the newly finished 1971 Topps Baseball set. There's a couple of cards I may need to upgrade but it's sure a great looking set. 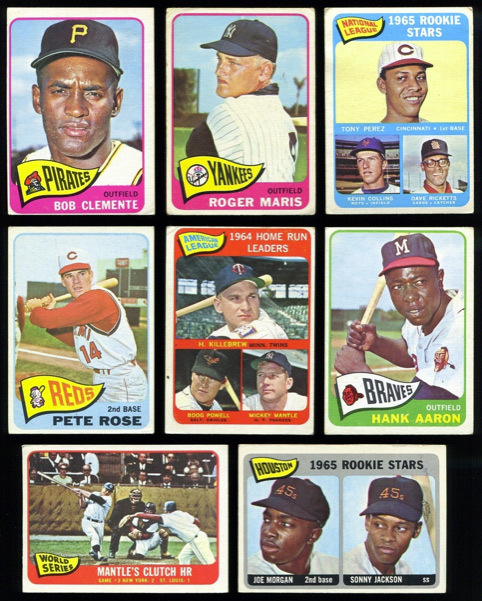 And if you have any '68 Topps kicking around—working on that one as well but still need some big cards there, most noticeably the Ryan rookie. Thanks for reading and be sure to check back as I will try to put more cards on my TRADE BAIT page. I know there are some bloggers that still collect these tiny pieces of cardboard, whiles others could care less for them. Some like to build team sets of the minis, some like to build Franken Sets (1–30 from all different years), but me, I can't enough and am still in the process of building all the mini sets. 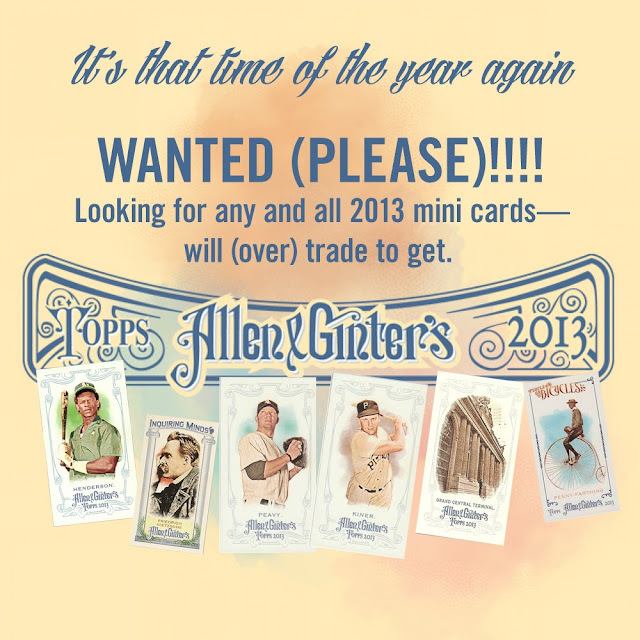 As you can see from my wants pages, I love those Ginter minis. Please check my past trade-bait posts and hopefully I can find something to trade for your minis. I do have a bunch of extra minis from previous years to trade as well. Ginter not your deal ... have other cards to trade from the 60's on to present. Please drop me an email—it'll be worth it as I tend to over trade (see past trades). Thank you again and I look forward to trading with you. 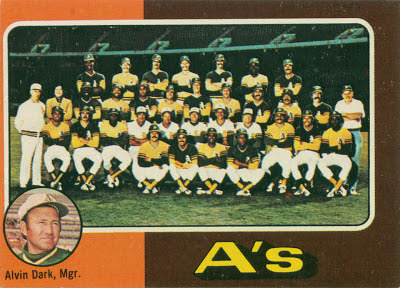 How appropriate that the last card I needed for my 1975 Topps set was this Oakland A's team card. 1975 would the last taste of playoff baseball Oakland would see for the next six years. The won 98 games while finishing first in the American League West but wound up getting swept by the Boston Red Sox in the 1975 American League Championship, 3-0. 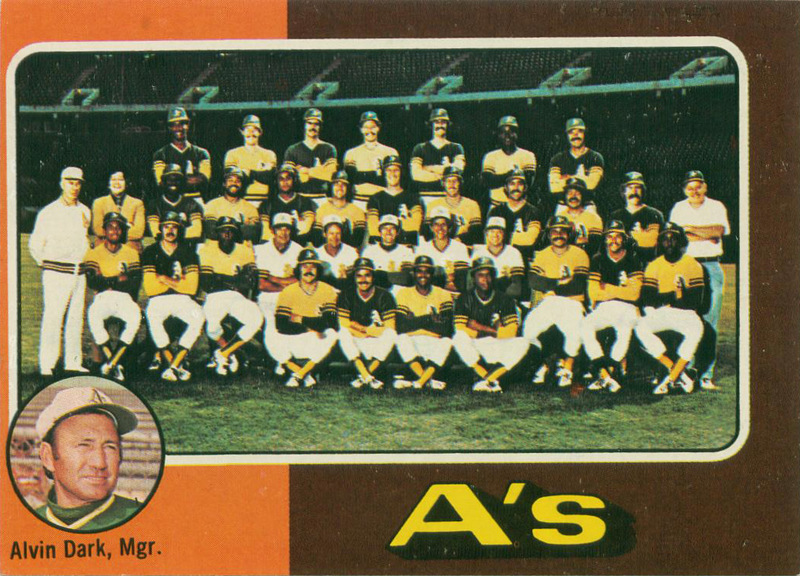 One thing I love about this card is the alternating green and yellow jerseys, and then throwing the coaches in their white tops and white hats that they wore. Makes for a nice team shot of this colorful gang of the early 1970's. Dug through some of my 60's Topps last night and low and behold I found another two high numbers along with another five cards I will need for my new 1965 Topps set. I certainly will have my work cut out for me as whoever had collected this set, they must have go away to summer cap or went on vacation during the summer of 1965. Does anyone know when these series' would have been release during the course of 1965? It would be willing to bet in was during the summer months. I am guessing that this set was started by a kid and when we came back home for the start of the school year in September of 1965, got back to collecting this set and bought packs from the last series (Series VII: 523-598) as I am only missing 5 of these cards. Oh before I forget, I know there are a number of Dodger collectors on these boards ... if you happen to have a 1965 Koufax and would like to trade for a 1963 Topps Koufax, drop me a line. Maybe of you would rather swap for a different year? Of if you have a 1965 Willie Mays, Ernie Banks, or Carl Yastrzemski, I would be willing to part with that 1963 Koufax and/or 1964 Topps Koufax World Series card. Check my archives too for those and other cards I would be willing to trade. Again, if you have any information on when Topps would release certain series', I would love to hear about it. Thank you for reading. Been a while since I have posted on the this blog. I have updated some of my want lists as I continue to plug away at some of my Topps Sets and All-Time Red Sox collection. I managed to hit up a card show in Stratford, CT on Sunday while visiting the inlaws. Ended up really at one table for about 90% of the time I was there. I had cleaned up almost all his 1971 Topps short prints some months back. No new cards there, but did pick up eleven 1968 Topps high numbers for a buck a piece. Also had a number of late 1950's and 1960's Red Sox available in the $1–3 range as well. Knocked off eighteen Sox needs there. At another table I did manage to find one 1971 Topps SP to cross off. 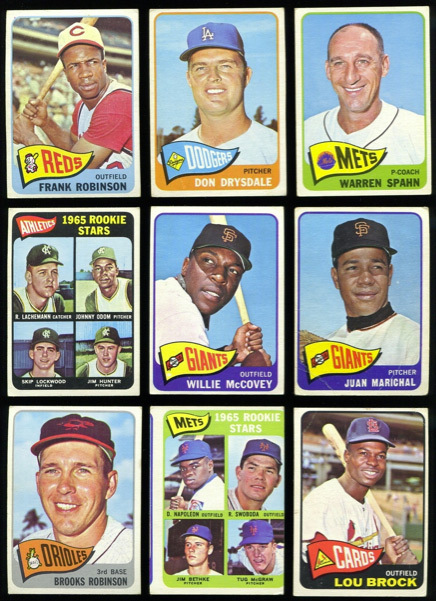 Which brings me to my next set chase and my favorite set of the 1960's ... the 1965 flagship set. I have always loved the bold colors, the seldom used pennants, and I find the photography to be pretty top notch for this decade. Also, the high numbers aren't out of reach like other sets from this era. And no variations either to chase down. So I manged to win this ebay auction over the weekend. Like the couple of other sets I have been chasing, this partial (half the set) set has a number of stars, rookies, and high numbers already. Not too picky about the overall condition as this fits my budget just fine. If any of you have some 65 Topps to trade, I would love to hear from you. I have a number of stars and commons from 1960–1979 that I would gladly trade to inch closer to completing this beauty. Drop me an email or comment below. I will be uploading a wantlist later today. Hope to trade soon! 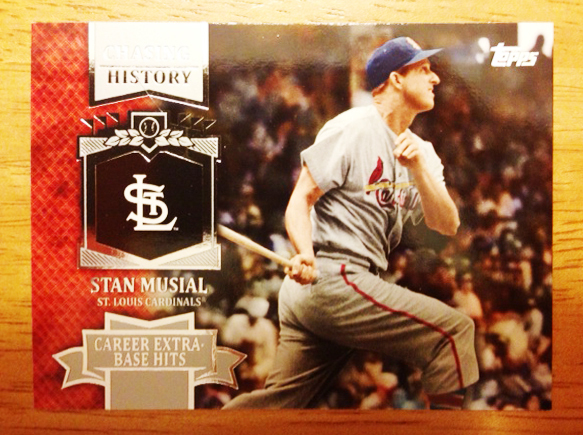 Ok, so not a baseball card post today, but I'll let this Stan "The Man" Musial help me lead into this post. I am sure many on this blogroll play fantasy baseball and I know a couple of you readers are in this same league that I am referring to. It's a 30-team, franchise, dynasty league that is starting up. I am not the commisioner but did say I would try to help him fill in the last three spots. The league charter is linked under my want lists for you to look at. I have played with a number of the guys in the league and it's a great group. There's a good amount of trading and people are from all over the country and a couple outside the U.S.. It is a daily league and you need to be active in that you have full active rosters. The emeralds are not numbered. Not collecting these, nor the pinks or camos. So any I get, they'll be available for trade. And first Red Sox of 2013, is Salty. Too bad he may be traded come Spring Training. I know I have another Red Sox on top of one of the two rack packs I got but not sure who it is. Will wait till tonight to open those. Some more, these from my second and third packs. LOVE, LOVE, LOVE THIS SHOT!!! And nice that's not a short print. Target Reds are back, not serial numbered. Also not in every pack. All in all I limited myself to 15 loosies (from a retail box and gravity feeder) and two rack packs. The had the deck boxes (72 cards) and the blasters. All the prices are the same as previous years for the entire line of retail product. 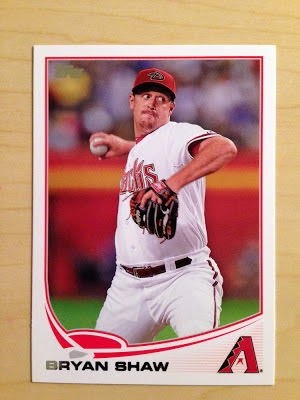 Ok time to get back to work but just wanted to share with you that 2013 Topps retail is live! It's a great looking product from the few packs I have opened and will definitely be putting this set together. 2013 Topps Retail and in my hands! So just popped over to the Target around the corner from work (North Shore, Mass.) and behold ... UNTOUCHED single packs, drop box box packs, rack packs! Normally this Target doesn't put product out early but it did today! So with that, the first card in my first 2013 Topps pack. Will post a couple more cards shortly.